A teenager "murdered" his mother and younger brother after being given a vacuum at Christmas, according to a court. 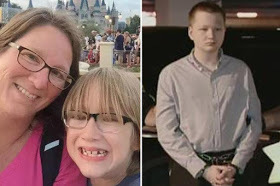 Supposedly, Jacob Remalay shot dead his relatives under a personality named "Wrath" after his parents bought his brother a trip to Disney World. Westmoreland County Court in Pittsburgh was told that Remalay, who was 14 years old at the time, was allegedly rejected by his parents in favor of his younger brother, Caleb, eight. Doctors gave details of other Remalay personalities, including a witch, an elder and a small girl, at a hearing to decide whether their trial should be moved from an adult to a juvenile court, reports KDKA. Public defender Wayne McGrew told the court: "I do not know how long Wrath has been involved, but he's getting stronger and stronger within his personality. "Once he left the altered state, he was very sorry and very depressed because he knew that the police testified in the hospital, Wrath went out and told everyone what really happened." Remaley's father, David, also testified before the court, saying he had a "bad opinion" as a father. His son, now 16, is accused of shooting his mother Dana, 46, and Caleb died with a gun at his home in New Stanton, Pennsylvania, in November 2016, while his father was at work. David supports calls for Jacob to be tried in a juvenile court.